This is going to be a possible Kick Starter Project… The idea is to try and put a flexible LED panel on the front of a simple T-Shirt. If it has to be detachable at this point that’s ok… it could be velcro. The display would display a QR code based on heat, like an old fashioned mood ring. 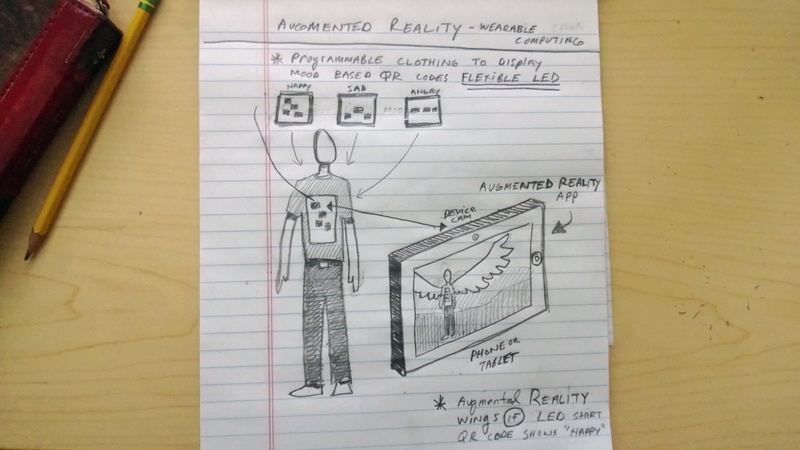 The Augmented Reality app would be built for iPhone, Androids, Windows Mobile and would simply detect the QR code and show Avatar style graphics around the person wearing the T-Shirt. in the drawing I’m showing Wings on the persons back, but the possibilities are as endless a 3D artists imagination. The great part about the (T-shirt, Flexible LED, QR code mobile viewing APP) Eco-system is it can change based on an Administration app that could be sold with the T-shirt where the user can change the Avatar style 3D graphics. The process could be similar to the personal Avatar builder for the Xbox. This entry was posted in Uncategorized and tagged Concept, Flexible LED, Mood Based, Programmmable Clothing, QR Code, Wearable Computing, Windows Phone 8. Bookmark the permalink.